I still freak out every single time I see the BigDog quadruped robot doing its thing. That's probably the same reaction that enemy soldiers will have when they see its final version coming towards them, carrying 400-pound of gear. Darpa has finally approved the contract for Boston Dynamics' LS3—which stands for Legged Squad Support System—for the US Marines. Like BigDog, it will travel autonomously for 20 miles without refueling, carrying 400 pounds of equipment for the soldiers in its squad. If LS3 can offload 50 lbs from the back of each solider in a squad, it will reduce warfighter injuries and fatigue and increase the combat effectiveness of our troops. 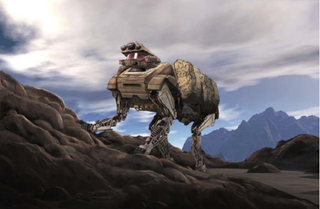 The LS3 program shows just how serious DARPA and the Marine Corps are about building practical, legged robots to offload our dismounted troops. Makes perfect sense. Let's hope that the brilliant engineers at Boston Dynamics—who are not only doing amazing robots for the military, but amazing robotic systems, period—can bring their amazing developments to other aspects of human life beyond war.